Watch a teaser for My Favourite Faded Fantasy below. You can get the full version of this track if you pre-order the album on iTunes or through damienrice.com. It's been eight years and it's finally here. 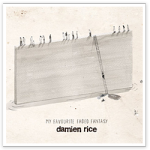 Damien's third studio album, My Favourite Faded Fantasy, produced by Rick Rubin and Damien, is available to pre-order now through damienrice.com, iTunes and Amazon.